Our Low Recoil Practice Ammunition allows owners of safari rifles to practice as long as you want without the issue of the powerful kickback cutting your sessions short. To make practice consistent with full power rounds, the point of impact should be the same at 50 yards as with full load rounds of the same type. So, there should be very little difference when changing to full loads. By using low recoil rounds for practice, you can develop very strong familiarity with the rifle all the way through pulling the trigger -which is where it matters most. Once you are well practiced with the Low Recoil rounds, it is recommended to switch to practicing with Intermediate Recoil to make the transition to the full power rounds without a huge jump in kickback that might alter your well practiced form. 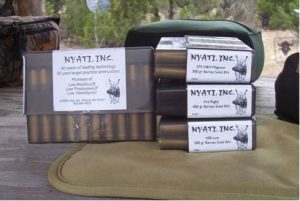 Nyati Inc is now producing Intermediate Velocity and Full Load High Velocity rounds using the same processes as our original Low Recoil Ammunition. Practice with the Low Recoil rounds until you feel mastery with your rifle, then use it with Intermediate power rounds for typical hunting. When you are facing off with Dangerous Game, have our Full Load High Velocity rounds chambered. All Calibers Showing Low Velocity Specs. Click to choose your caliber.